I’m still very much a newbie in the world of blogging, but I keep seeing references to BlogHer…and then those that can’t attend BlogHer. Like I said, until recently, I didn’t even know there were blogging conventions…but it makes sense and I can definitely see myself becoming a bigger part of the blogging community in the future…just not now. So instead of attending BlogHer, I’m jumping in on Pensive’s Annual Blog Hop as a way to connect with other bloggers. Perhaps you’d like to join? Click on the button below for more information. If you’re new to my blog, my name is Ashley and I started blogging in December, 2009 shortly after getting married and purchasing my first DSLR. I’m pretty transparent and you can quickly tell after scrolling through my blog that I have a true passion for photography and photo editing. I am usually the first to jump into a new photo challenge and I’m often amazed at the amount of projects that I’m willing to take on. For the month of August, I am hosting the In a Yellow House Photo Challenge for Chelsea while she’s on vacation. The current theme is “the Animal Kingdom,” and next week’s theme is “On the Road.” The linky goes up every Tuesday morning and runs through Saturday evening. 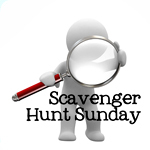 I am also hosting Scavenger Hunt Sunday, meant to be a fun way to photo capture five new items each week. This week’s items are: silhouette or shadow, motion blur, magazine, ten and glass. Anyone can participate and the link goes up each Sunday morning and runs through Monday night with a new list presented each week. If you click on Before & After and/or Tutorials , you’ll be linked to all of the various editing work I’ve done since the conception of this blog last year. There was a period of time where I edited a lot of other people’s work. More recently, I have been more focused on building my own photography skills…however, I am always accepting new challenges and would be happy to edit a photo for any one of my readers – just click Contact Me. I actually have a few in my in-box that are waiting to be edited right now. Another thing you’ll see on my blog from time to time is MAIL. I have recently started participating in two projects: Post Crossing and the Dear Darlings Penpals. I really enjoy getting physical mail and I found that in this age of technology, that the only mail I was receiving was JUNK mail. So, I took matters into my own hands. The intent of the postcrossing project is to allow people to receive postcards from all over the world, for free (well almost free). The main idea is that if you send a postcard, you will receive at least one back from a random Postcrosser from wherewhere in the world. So far, I have sent one postcard and received two postcards. I just ordered some custom postcards recently, so stay tuned for a review of that product/service (and no, I wasn’t paid to review the product/service). So that’s me in a nutshell. I love making new friends and I’m pretty good about returning comments (unless I’m out of town in which case, I always give a heads up). If you’re a new follower or just stopping by, please leave a comment so I can return the favor. Have a great day, night and weekend!